There’s nothing duller than a portable battery in the chromed and colorful world of consumer electronics. They’re thick dense slabs of lithium-ion cells we carry not because we want to, but because we have to. So what if I told you there’s a long-lasting battery with as much gadget appeal as Google’s doomed Project Ara? Meet the modular 94Wh / 25,600mAh River Bank from battery upstarts EcoFlow. It doesn’t look like a typical battery — because it’s not. It can charge up to five devices simultaneously or act as a three-port USB hub while charging your laptop. Attach a stackable second 44Wh / 12,000mAh booster module to create an even bigger battery with a sixth charging port that’s still suitable for airline travel. Hell, it can even jump start your car. Over the last few months I’ve tested a River Bank on trips through the ice and snow of the Austrian Alps, the brutal dunes of the Sahara Desert, and the tawdry coffee houses in the space between. And you know what? I’ve become smitten with a lowly battery. Let’s start with the charging capabilities of the main River Bank module. Its 94Wh of capacity will be more than enough for most people, and features two fast-charging 60W USB-C PD ports, two full-size 24W USB-A ports, and a top surface that’s actually a 10W Qi wireless charging pad. I took it on two trips and never ran out of power, despite liberally filming my snowboarding and kitesurfing adventures with GoPro cameras, stabilizers, phones, and a half-dozen power-hungry accessories. Naturally, I charged all my devices and the battery each night, made easier by the River Bank’s pass-through charging feature. Before going to bed, I’d plug one end of the 40W EcoFlow charger into the wall outlet and the other end into the River Bank’s USB-C PD port. In this way I could charge the River Bank’s battery while also charging my iPhone on the charging pad; and my GoPro, GPS watch, and whatever accessories needed attention off the remaining USB ports. This spared me from carrying individual wall plugs for all my devices. In the morning, the River Bank, now fully charged, was small and light enough to toss into my backpack to keep my devices topped-up throughout the day. My review unit shipped with a form-fitting case that zips shut to keep the battery dry and the ports free from sand and other debris. Its internal pocket was perfectly sized to carry a quiver of cables to meet all my needs: USB-C-to-USB-C, USB-A-to-USB-C, USB-A-to-Lightning, and USB-A-to-microUSB. At home, I keep the River Bank in a drawer, where it’s said to maintain a charge for up to 6 months (a claim I haven’t been able to test). It’s become a useful accessory to my MacBook since my favorite local cafe lacks any electrical outlets. 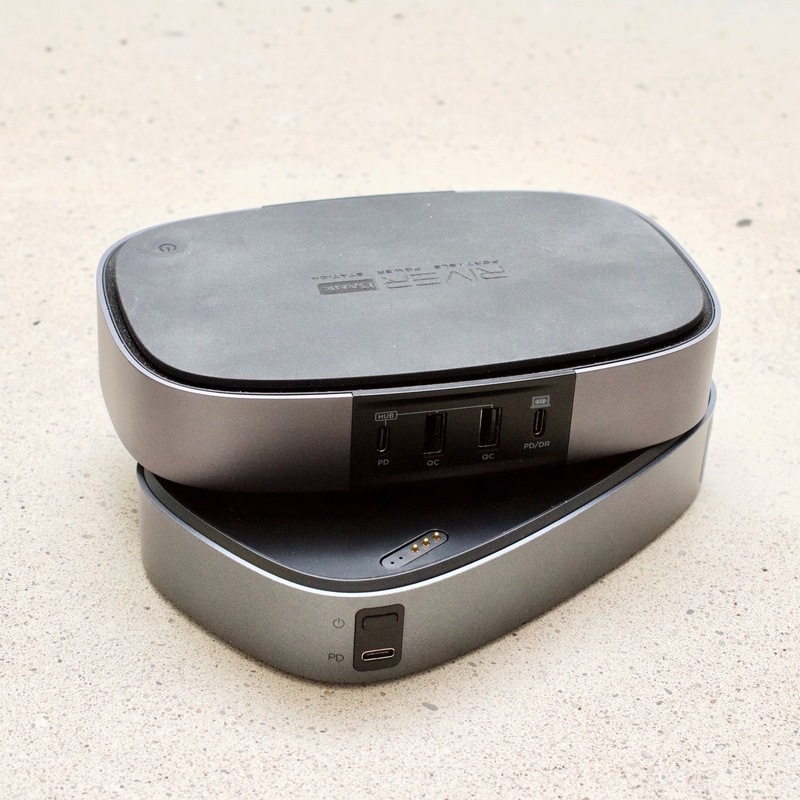 There the River Bank can also transform into a three-port USB hub, powering my single-USB-port MacBook while also allowing me to transfer files to a portable SSD. As a bonus, it charges my MacBook at a full 60W over USB-C instead of the 29 watts delivered by Apple’s charger. That’s great for me, but might not be enough for owners of real laptops that demand more power. Wireless charging your phone or earbuds on the top of the battery causes a white light to pulse inside the upper-right corner. It’s not terribly bright, but it’s something to be aware of if you’re sensitive to light and thinking you might want to use the River Bank as a bedside charging hub. Fans of minutia will enjoy watching the River Bank’s LED display. Like the display found on the original 400Wh River launched in 2017, it shows a real-time view of the power being consumed by your gear. It’s a far better display and user interface than I’ve seen on similar batteries from companies like Goal Zero but it’s not very visible on sunny days. Watching the power meter adjust to the needs of all your connected devices is fascinating, in the same way that viewing the data collected by fitness trackers sates curiosity about your daily movement. And like fitness trackers, I suspect many will lose interest in the display just as soon as they’ve learned the consumption habits of their devices. Others, like myself who own a wide variety of devices that are regularly replaced, will find the read-out intoxicating. EcoFlow also sells a stackable Car Booster module that adds a sixth charging port (60W USB-C) and a place to plug in the bundled jumper cables. It also increases capacity to a total of 138Wh / 37,600mAh. This unique stackable design lets you skirt FAA rules that limit individual carryon batteries to a maximum of 100Wh. I’m unclear how that’s better than carrying a 100Wh battery and a second 38Wh battery that doesn’t stack, but it does give EcoFlow bragging rights to “the largest capacity rechargeable battery in the world that you can take anywhere,” for whatever that’s worth. EcoFlow says the Car Booster module holds enough power to jump start gasoline engines up to 4.0L / 2.8T or 3.5L diesel engines pulling a maximum of 350A at 12V. And it can do this up to 10 times. I wasn’t able to test the booster myself, but it’s a nice insurance policy for those intent on going even further afield. I did, however, stack the two modules together. Doing so causes the total wattage available to jump as a second battery meter appears on the display. The magnetized snap announcing the physical union was satisfying to be sure, but I’m unconvinced that it’s a significant advantage over two consciously uncoupled batteries. The River Bank Main Module is available to preorder now for $249 in North America. That’s not cheap, but it’s $50 less than the Goal Zero Sherpa 100AC for those who don’t need portable AC power. It is, however, more expensive than traditional battery slabs from the likes of Anker, Ravpower, ZMI, and Jackery that offer similar capacities but less functionality. River Bank doesn’t ship with any bundled USB cables, but it does come with a 40W USB-C wall charger in the box unlike many competitors, and a free $29.99 zippered case for those who preorder now. The price jumps to $369 for the Jump Pack which also includes the Car Booster module. It’s not for everyone, but could buy you some peace of mind if you’re a fan of driving deep off the grid.